Are you curious about Python? Do you want to get started in computer programming with this easy and powerful language? Would you like to join the massive online community of Python users and developers? If so, Python – The Comprehensive Guide to Python Programming for Beginners is the book you’ve been waiting for! 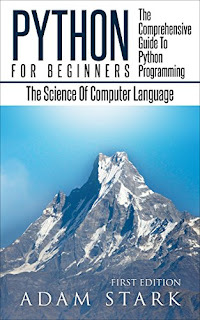 It includes thorough, complete instructions for all of the basic aspects of Python. You’ll undertake a variety of exercises, but don’t worry – the answers are in the back! Did you know that programmers have written many of today’s most popular applications (like YouTube) in the Python language? It’s true – when you get the solid grounding in Python this book offers, you’ll be ready to enter the real world of power programming. This object-oriented programming language is highly interactive and perfect for beginners. (The Python language is very close to the English language.) If you have experience in other languages (like C), you will notice many familiar elements in Python. Python is easy to read and learn – and it’s simple to maintain. It has an excellent standard library and is packed with databases. This comprehensive, portable, and extendable language offers top-notch GUI (Graphic User Interface) programming. Chock full of examples, explanations, exercises, and solutions, this book gives you everything you need to get a good head start on your Python education! Don’t wait another minute – Get your copy of Python – The Comprehensive Guide to Python Programming for Beginners right away! You’ll be so glad you gained this valuable skill!